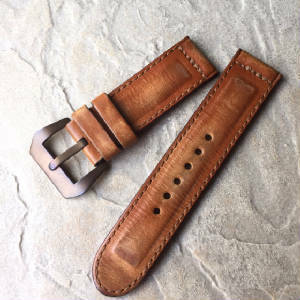 Welcome to Stonee Straps ...handmade leather watch straps for your Panerai and any large watches. 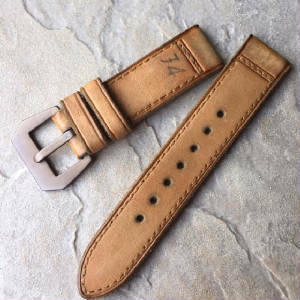 My straps entirely handcrafted and I only use vegetable tanned leathers and genuine vintage WWI and WWII ammunition pouches to make our straps. Each piece of leather is maticulously measured, cut, punched, stitching, hand sewn, finished, burnished, and conditioned to the finest straps. All these process are certainly done by hand and simple hand tools that the leather makers have been employing for generations. I offer 5 series of straps in my current collection: Classic Series, Art Series, Historic Series, Ammo Series, and World Series. Beside the watch straps, recently I also added the Mid and Long Wallets (Biker Wallets) to my product line as well. So, if you are interested in any strap or wallet you see from my collection and would like me to build a customized strap or wallet to your specification, please don't hesitate to email me. I would be glad to hear from you to provide what you want. Because, my intention is to build the best handmade straps to your full satisfaction and of course, quality is my absolute goal. If you are unhappy for any reason with your strap, I will try to make it right or refund your money.